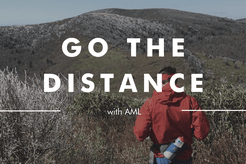 From March 18th to May 8th, AML will be hosting our 3rd annual Go the Distance milage campaign. Getting set up to participate is simple. The first step is finding our campaign page, and you're already here. From here, you’ll see that we have a goal of raising a total of $15,000. Our sign-up period will run from March 18th through April 7th, and participants will begin accruing mileage/distance from April 8th through May 8th. First, you can choose to make a pledge towards a goal that another person has already established. To do that, simply click on the 'contribute' button above and you will be guided through the process of donating towards someone else's goal. You may pledge per mile/distance or make a set donation towards their fundraising goal. Second, you can participate by setting a mileage and fundraising goal yourself. Then, you can begin to invite and gather a team of folks that are willing to make pledges to help you meet your goal. You can set mileage and fundraising goals of any distance, but we encourage you, in the spirit of adventure, to be ambitious. Get those miles in a variety of ways... on a bike or by foot, climbing, or another creative mode of exploration or travel. Third, you can help us spread the word by sharing about AML and Go the Distance through word of mouth and your social media.